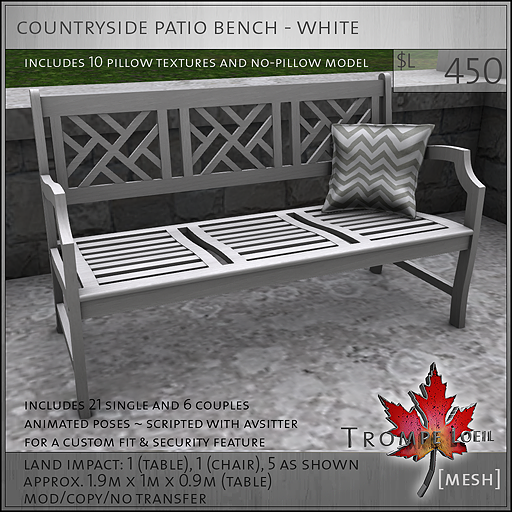 Explore outdoor living with Trompe Loeil’s new Country Pavilion, Countryside Furniture, and our massive Pergolas super packs – all exclusively at FaMESHed for July! The new Country Pavilion is a perfect addition to any outdoor entertaining or lifestyle plan. At a roomy 18.5m by 16m, its big enough to move freely and feel the breeze, but still intimate enough for casual chats late into the summer night. The built-in fireplace features on/off lighting, flames and smoke on touch, plus removable wall lights (also available separately) increase your visibility. 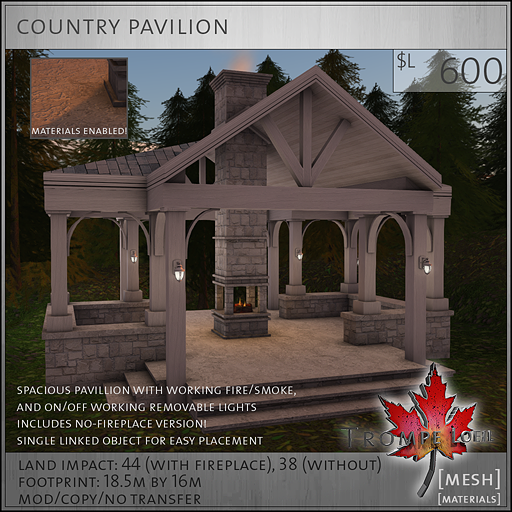 For all you early adopters, the Country Pavilion is also materials enabled! Package includes non-fireplace version for even more decorating space! Check out the on-site display at FaMESHed; just use the teleporter on the front of the scaled down model to head to our display skydome. Our new Pergolas are truly something special – you get 3 models (open, single wall and double wall) with 5 versions each (plain, fabric drape, flowers, string lights and flowers + string lights), plus two LOD versions for each combo so you can create the perfect balance of land impact and distance visibility! The flower versions include 13 options available on owner-only touch menu, the stringlights turn on and off with a soft glow, and the fabric version is easily tintable to match any color scheme. Available in brown or white wood, they’re the perfect outdoor decor addition! Last but not least, our Countryside Patio furniture collection fits effortlessly into any modern, country, or traditional outdoor style. 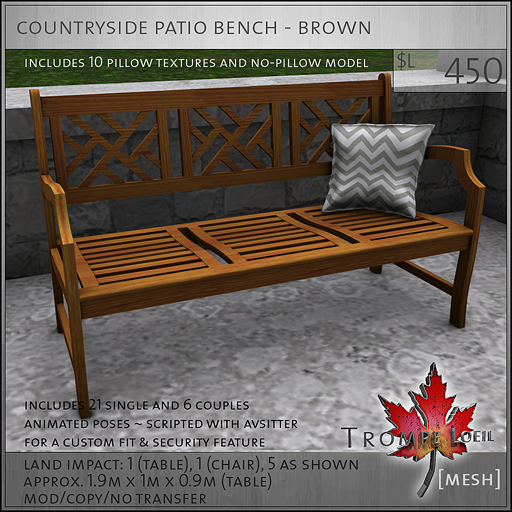 Available in white or brown wood, indulge in tons of single and couples animations and 10 fabric options for the pillow (non-pillow version included). 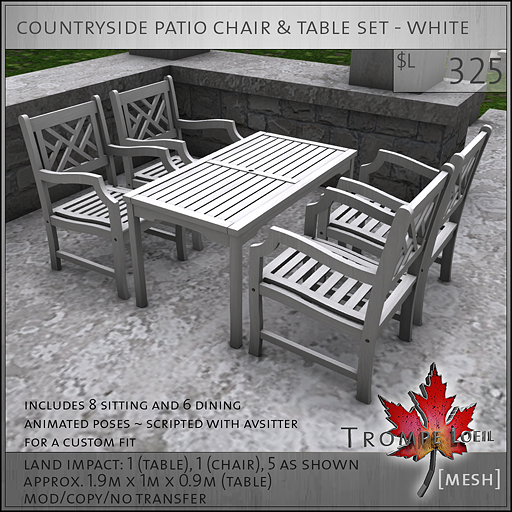 Try out the display models for yourself at FaMESHed all through July! 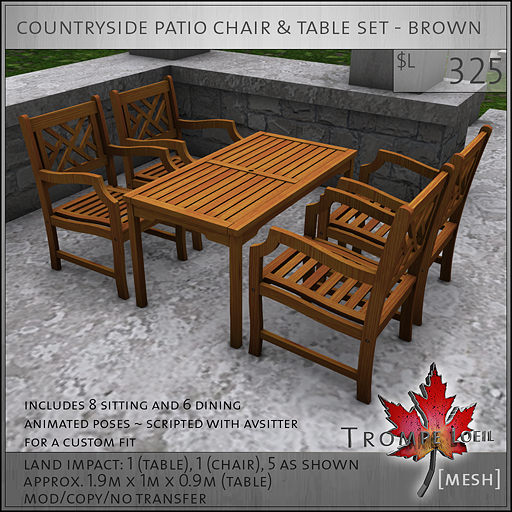 Rustic Cabin FREE Update – Now with Materials!